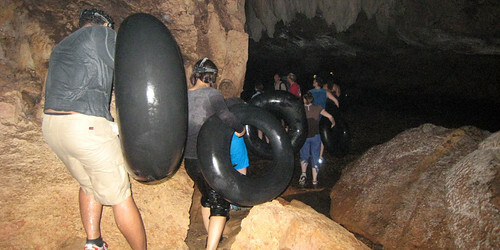 On Wednesday, we signed up to do cave tubing at Jaguar Paw. But because another couple at Black Rock Lodge — Brian and Lauren from Long Island, New York — had already signed up for a similar excursion from a different resort, the management asked us to tag along with them. “It’s more expensive, but we’ll give it to you for the same price,” they said. And so we did it. At Ian Anderson’s we joined folks from two other resorts. Our party of nine piled into an old school bus. Our guide Pablo sat behind the wheel, and we started our journey. 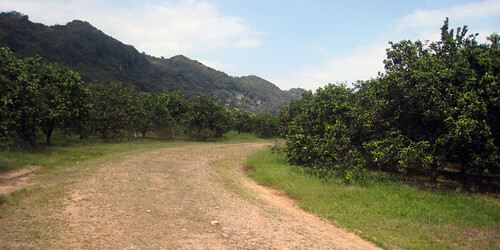 I wish I’d managed to get a shot of the hills that lined both sides of the orchard valley. With the low morning clouds hanging over the forest, it was absolutely gorgeous. At one point, our rickety old school bus actually forded a river bed. Fortunately, the river we crossed was just a stream, though the bed itself was very broad (and filled with stones, not mud). Eventually, we reached our destination, unloaded the tubes, and walked to the river. Instead, I had maybe 30 seconds. 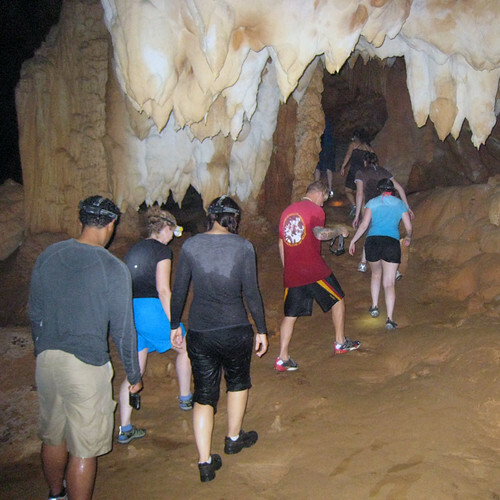 Once inside the cave, we alternated between paddling in the water and getting out to carry our tubes. We paused now and then to look at the cool stuff: a set of rapids (or was it a waterfall?) that disappeared into the wall of the cave, the bats perched in the ceiling, the artifacts left by Mayan people hundreds (or thousands) of years ago. 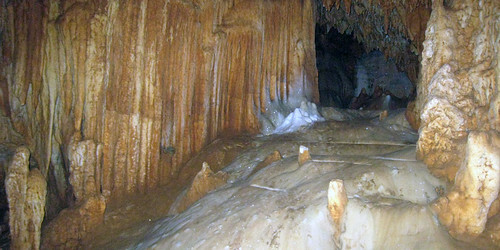 And, of course, the caves were filled with stalactites and stalagmites and other interesting rock and mineral formations. After tubing upstream for a ways, we piled out and climbed into the cave’s upper reaches. Here, our guide Pablo sat us down to give us a brief lecture on Mayan culture, the history of the cave, and the nature of the artifacts that have been left behind. After we were finished exploring, Pablo spread a sheet on a relatively flat “beach” beside the river. We made a lunch of salami tortillas and hard-boiled eggs while chatting with our companions. 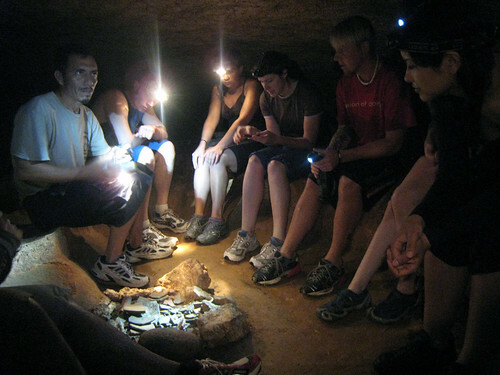 At one point, we all turned off our headlamps to experience the total darkness. It was a little bit frightening, but it was fun. It was so fun, actually, that we did it again after lunch. 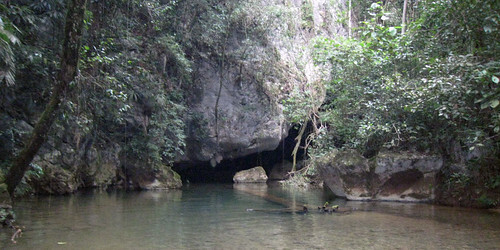 To exit the cave, we climbed into our tubes and floated on the slowly-moving current. At times, we’d all turn our lights off so that we were floating in the dark. Without light, and with a uniform temperature all around (we’d become accustomed to the water), it was impossible to tell whether we were moving or not. It was eerie, but neat. According to Kris’s notes, we were in the water for four hours, though it certainly didn’t seem that long. I could have stayed on the water all day. I really enjoyed the tubing. After exiting the cave, the group paused for a few minutes so that the brave souls (most of the group) could leap from a cliff (maybe 20 feet high?) into the swimming hole below. We cowards (including me and Kris) had fun watching. Back at Black Rock Lodge, dinner was amazing, as all the dinners had been. The food at the lodge is great, but in a home-cooked sort of way, not a commercial kitchen sort of way. The lodge grows its own produce in an organic garden, and they buy poultry, dairy, and eggs from the large Mennonite population in Belize. The soups at the lodge were particularly amazing, especially the cream of celery, which sounds gross but is actually fantastic. Look for a more extended rave about the kitchen on Friday, including the recipe for that celery soup! A note on water temperature: I keep describing the rivers in Belize as cool but not cold, and being about 16-17 degrees centigrade, but that’s just a guess. I don’t actually know how to judge river temperatures. I’m basing these guesstimates on the fact that room temperature is 20 degrees (or 68 fahrenheit), and the water felt cooler than that, but not uncomfortable. Of course, it may be that skin-on-water functions differently than skin-on-air. Maybe in water, you need body temperature (37 degrees) to fell comfortable, which would mean the water was closer to 30 degrees. Any scientists care to clue me in? Your “cool but not cold” water temp is probably in the low 70s (fahrenheit). I’m not a scientist, just a surfer. In water about 60 degrees, you’d likely be unconscious after 2 hours in the water. Awesome, Pat. Thanks. That’s great info. My big question then is: Can the water be *warmer* than the air but feel *cooler*? What I love about these posts is the obvious joy you and Kris experienced while playing in Belize. And, I like that you did things that I don’t think of as typical JD & Kris recreational activities. It challenges my assumptions, especially ones I have about Kris (hiking? swimming in rivers?) . . .
Great video, thanks for sharing. 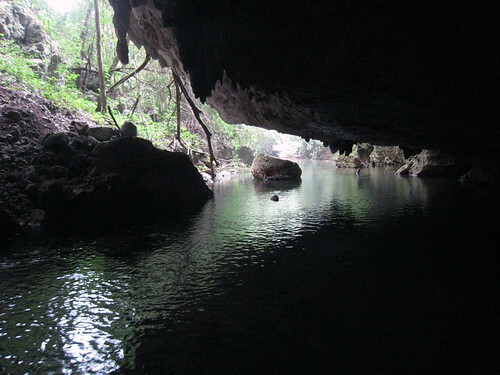 We didn’t bring our camera to the cave tubing expedition because we were concerned about it getting wet, so therefore it’s nice to see your pictures. Brian is anxiously awaiting the delicious celery soup recipe! I have walked in many caves in my life, but never had the experience of riding a tube through one. You two really had a neat adventure! Great picture of the cave opening.